2015 NCAA Division I Men's Basketball Championship - Second Round - No. 9 Oklahoma State vs. No. 8 Oregon. March 20, 2015: Oregon Ducks cheerleaders pose for a photo before a second round game between No. 8 Oregon and No. 9 Oklahoma State in the 2015 NCAA Men's Basketball Championship Tournament at CenturyLink Center in Omaha, Neb. 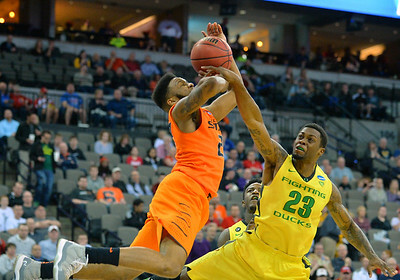 Oregon defeated Oklahoma State 79-73. 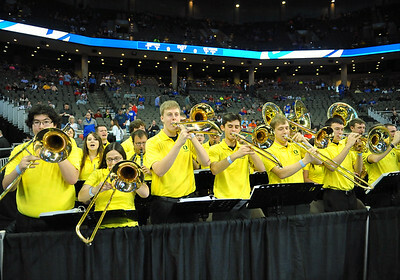 March 20, 2015: The Oregon Ducks pep band performs before a second round game between No. 8 Oregon and No. 9 Oklahoma State in the 2015 NCAA Men's Basketball Championship Tournament at CenturyLink Center in Omaha, Neb. Oregon defeated Oklahoma State 79-73. March 20, 2015: An Oregon Ducks cheerleader performs during a second round game between No. 8 Oregon and No. 9 Oklahoma State in the 2015 NCAA Men's Basketball Championship Tournament at CenturyLink Center in Omaha, Neb. Oregon defeated Oklahoma State 79-73. March 20, 2015: An Oregon Ducks cheerleader watches the player introductions before a second round game between No. 8 Oregon and No. 9 Oklahoma State in the 2015 NCAA Men's Basketball Championship Tournament at CenturyLink Center in Omaha, Neb. 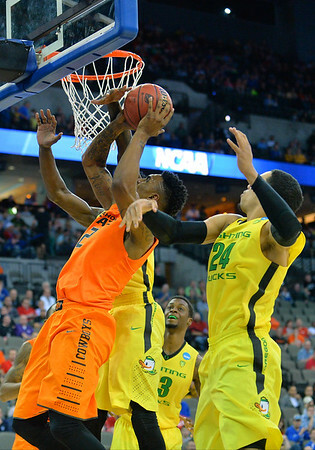 Oregon defeated Oklahoma State 79-73. 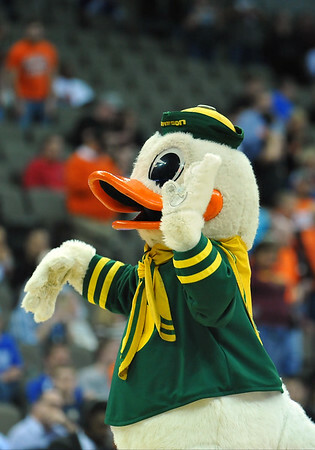 March 20, 2015: The Oregon Ducks mascot Puddles waves to the crowd before a second round game between No. 8 Oregon and No. 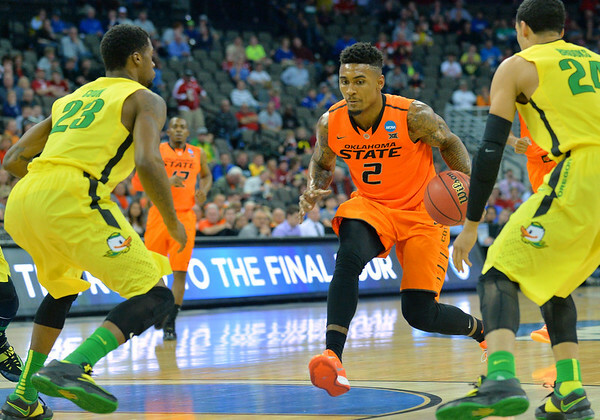 9 Oklahoma State in the 2015 NCAA Men's Basketball Championship Tournament at CenturyLink Center in Omaha, Neb. Oregon defeated Oklahoma State 79-73. March 20, 2015: Oklahoma State Cowboys cheerleaders perform before a second round game between No. 8 Oregon and No. 9 Oklahoma State in the 2015 NCAA Men's Basketball Championship Tournament at CenturyLink Center in Omaha, Neb. 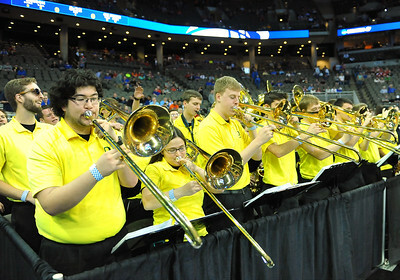 Oregon defeated Oklahoma State 79-73. March 20, 2015: Oklahoma State Cowboys guard Jeff Newberry (22) brings the ball up the court during a second round game between No. 8 Oregon and No. 9 Oklahoma State in the 2015 NCAA Men's Basketball Championship Tournament at CenturyLink Center in Omaha, Neb. Oregon defeated Oklahoma State 79-73. 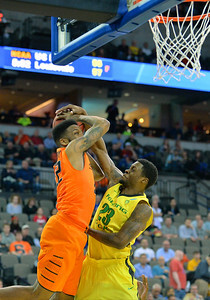 March 20, 2015: Oklahoma State Cowboys guard Jeff Newberry (22) has his shot blocked by Oregon Ducks forward Elgin Cook (23) during a second round game between No. 8 Oregon and No. 9 Oklahoma State in the 2015 NCAA Men's Basketball Championship Tournament at CenturyLink Center in Omaha, Neb. Oregon defeated Oklahoma State 79-73. 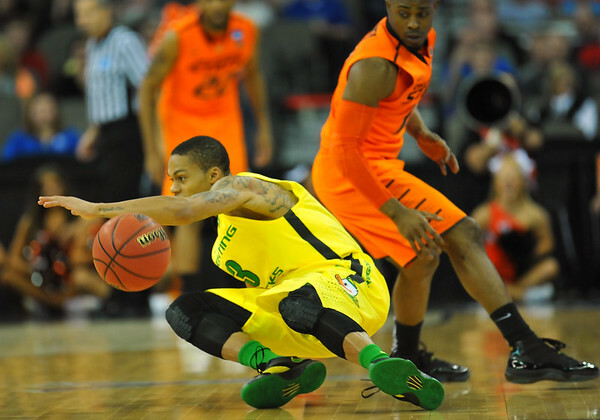 March 20, 2015: Oregon Ducks guard Joseph Young (3) stumbles during a second round game between No. 8 Oregon and No. 9 Oklahoma State in the 2015 NCAA Men's Basketball Championship Tournament at CenturyLink Center in Omaha, Neb. 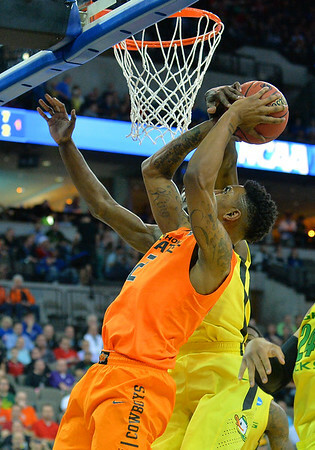 Oregon defeated Oklahoma State 79-73. March 20, 2015: Oklahoma State Cowboys guard Anthony Hickey Jr. (12) gets a layup during a second round game between No. 8 Oregon and No. 9 Oklahoma State in the 2015 NCAA Men's Basketball Championship Tournament at CenturyLink Center in Omaha, Neb. Oregon defeated Oklahoma State 79-73. 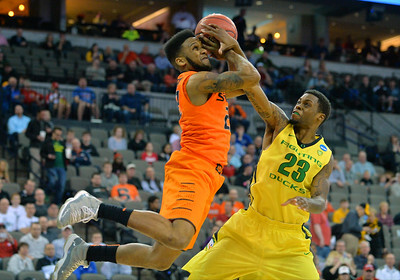 March 20, 2015: Oregon Ducks guard Joseph Young (3) has his shot contested by Oklahoma State Cowboys guard/forward Le'Bryan Nash (2) during a second round game between No. 8 Oregon and No. 9 Oklahoma State in the 2015 NCAA Men's Basketball Championship Tournament at CenturyLink Center in Omaha, Neb. Oregon defeated Oklahoma State 79-73. 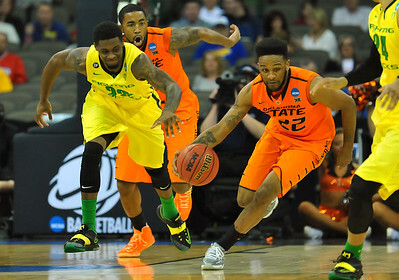 March 20, 2015: Oklahoma State Cowboys guard/forward Le'Bryan Nash (2) looks to drive past Oregon Ducks forward Elgin Cook (23) during a second round game between No. 8 Oregon and No. 9 Oklahoma State in the 2015 NCAA Men's Basketball Championship Tournament at CenturyLink Center in Omaha, Neb. Oregon defeated Oklahoma State 79-73. 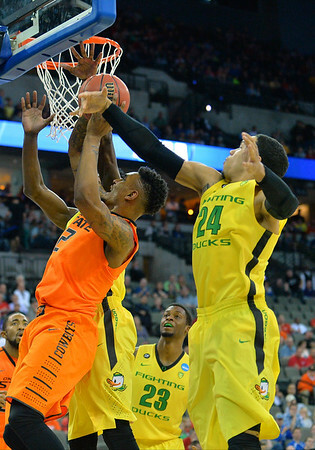 March 20, 2015: Oklahoma State Cowboys guard/forward Le'Bryan Nash (2) has his shot blocked by Oregon Ducks forward Dillon Brooks (24) during a second round game between No. 8 Oregon and No. 9 Oklahoma State in the 2015 NCAA Men's Basketball Championship Tournament at CenturyLink Center in Omaha, Neb. Oregon defeated Oklahoma State 79-73. March 20, 2015: Oklahoma State Cowboys guard/forward Le'Bryan Nash (2) has his shot blocked during a second round game between No. 8 Oregon and No. 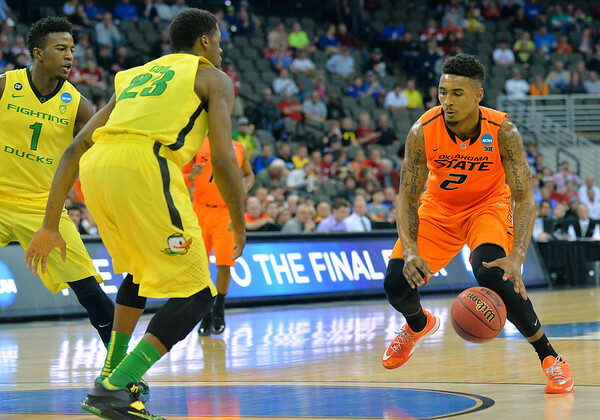 9 Oklahoma State in the 2015 NCAA Men's Basketball Championship Tournament at CenturyLink Center in Omaha, Neb. Oregon defeated Oklahoma State 79-73.